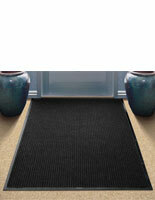 These gray entry mats feature a rubber backing that makes them resistant to slipping. The entrance carpets also feature polypropylene plastic fibers that collect water and dirt. The entry mats are ideal for keeping flooring clean in malls, stores, hotels and any other locations with high foot traffic. 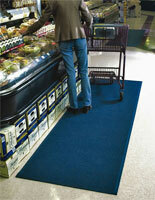 The rubber and plastic rugs dry quickly, preventing the proliferation of bacteria. 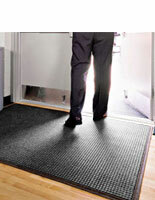 Each of the mats is Certified Slip Resistant by the National Floor Safety Institute and and anti-static rated at 1.2 KV by the AATCC. 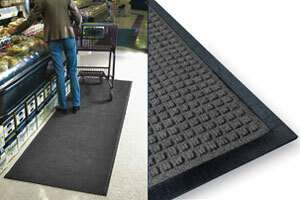 The entrance carpets measures 3' x 10', allowing them to cover large areas in malls and lobbies.